Okay this week's entry is kind-of lacking in effort. 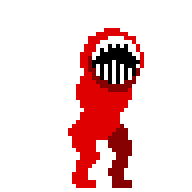 Here's a design for a bigger enemy I'm planning to add to Death Cabin. His name is Bob.